Survivors Teaching Students® brings ovarian cancer survivors and caregivers into medical education programs to educate future healthcare providers about ovarian cancer by sharing stories of diagnosis, treatment and survivorship, along with facts about the disease. 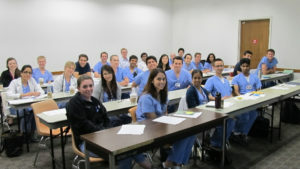 Medical/healthcare students interact with and learn from ovarian cancer survivors in a classroom setting. Staffed by more than 880 survivor volunteers. Schedule an STS® presentation for your school with zero cost to your institution. See a list of participating schools here. 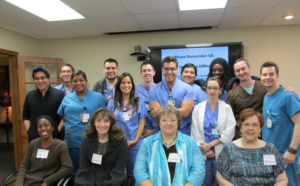 Share your story to educate the next generation of healthcare providers! To schedule a presentation or learn more about sharing your story, fill out our quick volunteer interest form, or contact Susan Leighton, National Program Director, at sleighton@ocrahope.org. For active STS® volunteers: access the STS Toolkit here, and enter the password provided by your Regional Coordinator. Survivors Teaching Students: Saving Women’s Lives® is supported by grants from EMD Serono, Gail Baird Foundation, Morphotek & TESARO.